For last few days I was craving for some Chingri (prawns)﻿. I was not sure what to make, the all time favorite 'Malaikari'(prawns in creamy coconut gravy) or the hastle-free 'Bhapa chingri' (steamed prawn in mustard sauce). 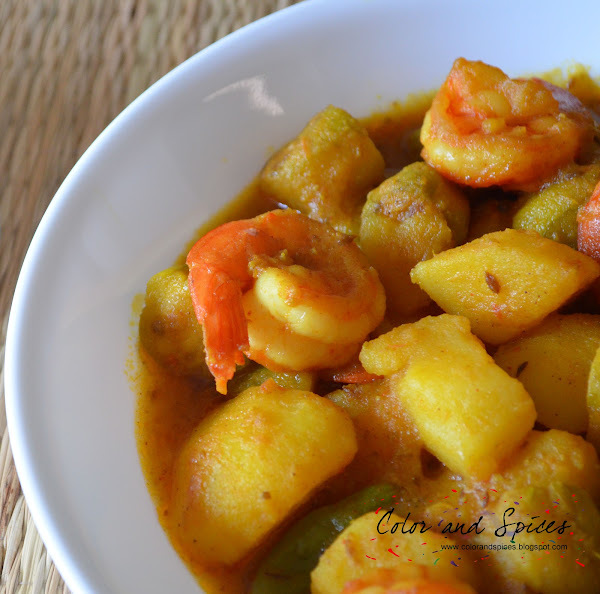 But when I got some potol (pointed gourd) from the Indian store, I thought of making my mother-in-law's special potol-chingri (prawn and pointed gourd curry). 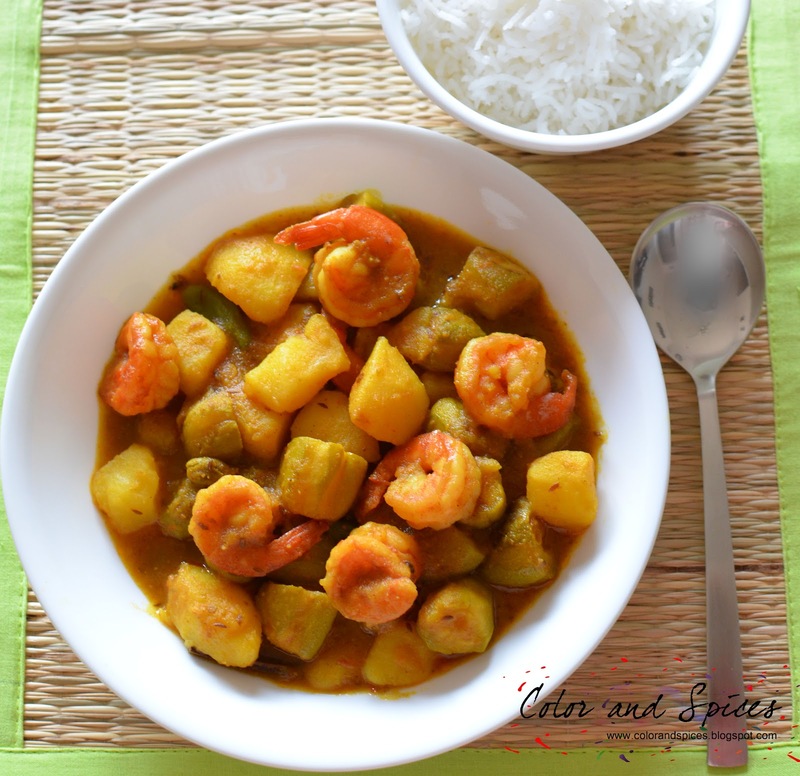 A flavourful curry, simple yet delicious and my daughter's favourite. 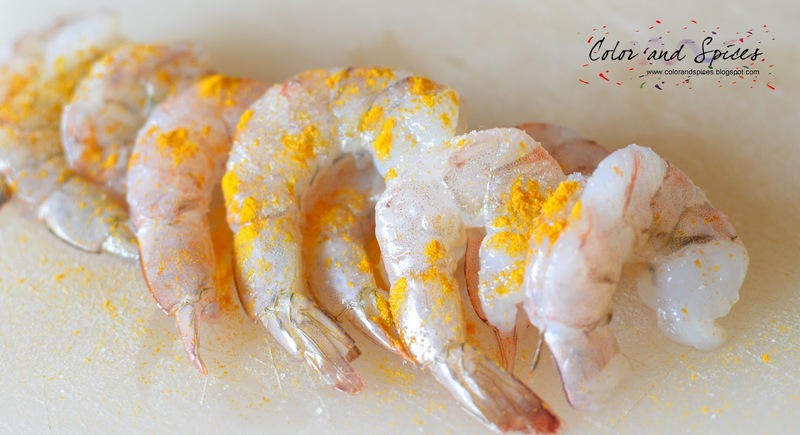 1.Clean the prawns, de-vein and marinate with little salt and a pinch of turmeric. I used frozen prawns without head, so I first thawed and then cleaned the prawns, but you can use fresh prawns, prawns with heads, that will give much more flavour to the dish. 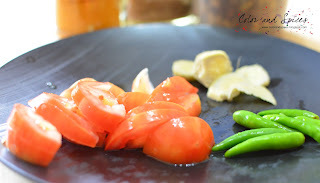 2.Make a paste of the chopped tomato, grated ginger and green chilies. 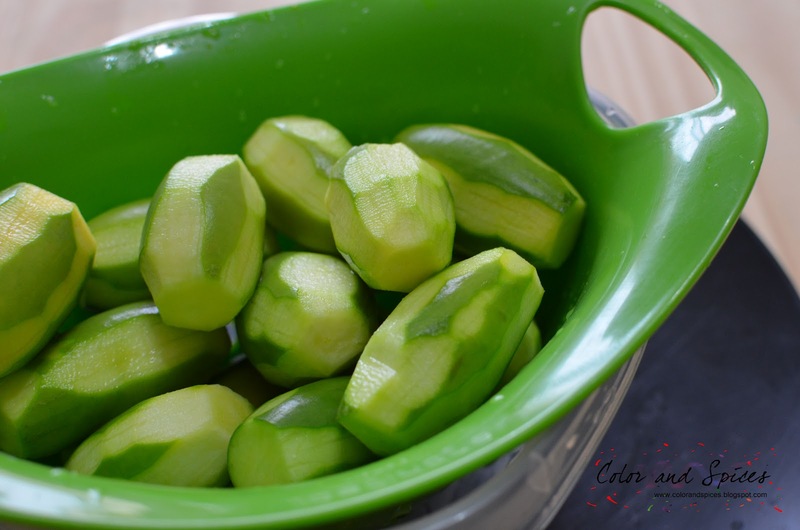 3.Cut the potatoes and potol(pointed gourd) into cubes, wash and keep aside. 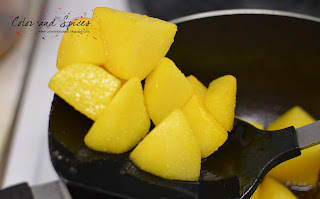 4.In a pan or kadai add some mustard oil (if you dont have mustard oil at home, use any vegetable oil, but mustard oil gives much better taste). 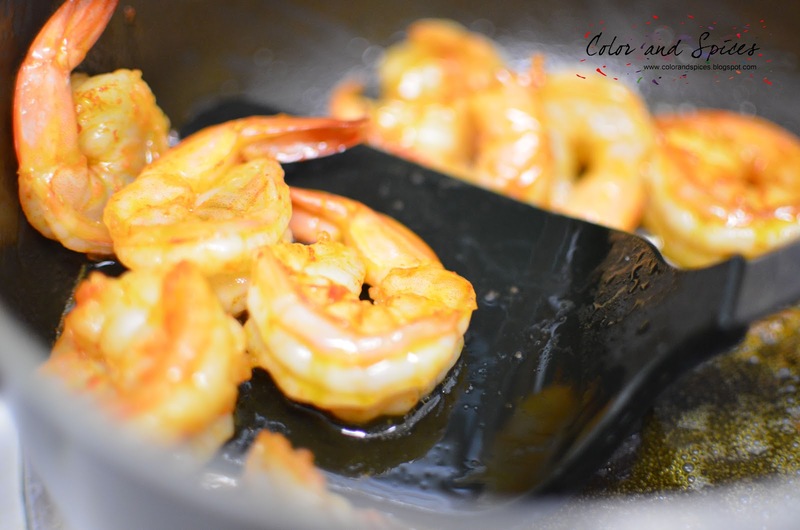 When the oil is hot, fry the prawns for 2-3min, till they change the color to red. Do not overcook prawns or they will turn very hard and chewy. Keep the fried prawns aside. 5. In the same oil, add the cubed potatoes and fry them till nice golden brown. Take out the potatoes and keep aside. 6. Now fry the potol, if needed add some more oil. Keep the fried potol aside. 7. Now add some ghee(clarified butter) to the pan. As the ghee melts add cumin seeds, cinnamon sticks, cardamom and bay leaf. 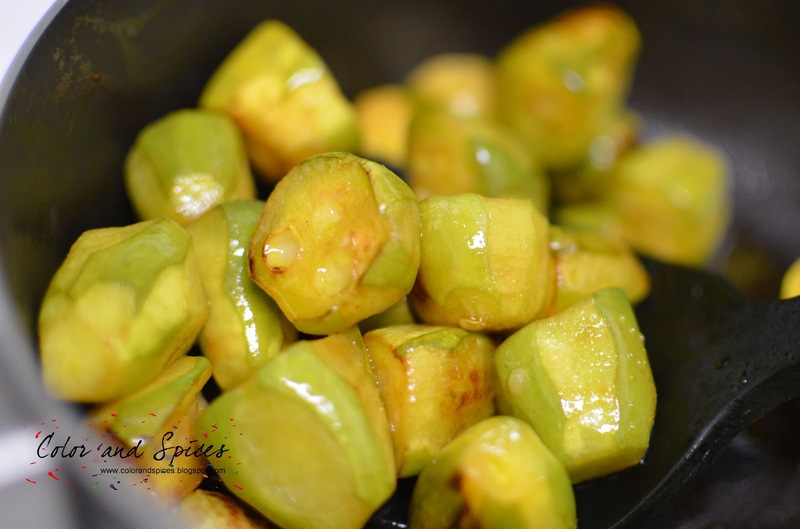 As the cumin seeds turn golden brown(take care not to burn the seeds) add the tomato-ginger paste. Add little salt, cover and cook in medium flame for 5 min. Give it a stir in between. 8. Add cumin powder, corriander powder, red chili powder, sugar and mix well. Cook for another 5 min in a medium flame. Keep stirring. If needed sprinkle some water so that the masalas should not stick to the base of the pan. 9. 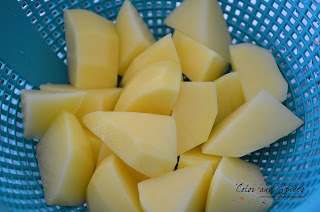 Add the fried potatoes and potol, mix well. Add hot water. Let the water boil, as it boils cover the pan and cook in medium heat till the potatoes are done. 10. Add the fried prawns. Mix well. Give it another boil. But again do not overcook the prawns. Add ghee and cinnamon powder. Mix well. Switch off the heat. Serve with some plain rice. Thank you so much Suchismita.